Almost everyone when asked about Irish food mentions two things – Irish Stew and Corned Beef with Cabbage. And almost every visitor to Ireland is surprised to find that neither features all that commonly on restaurant menus! In fact corned beef is not traditionally Irish at all – but Bacon and Cabbage is. That isn’t to say that such dishes are no longer eaten, they are, but they are homely dishes, served to family, rather than ones which would be chosen on an evening out. And so their appearance on a restaurant menu is a rarity. Most traditional Irish foods use simple, basic and cheap ingredients, a reminder of the fact that they originated in a less affluent past. Many have been given a modern twist by a new generation of chefs or incorporated into dishes that better suit the tastes of a more widely travelled population. Traditional Irish recipes tend to be very simple, with just a few ingredients in most cases. This should be no surprise – it was the food of the poor and they did not have a huge range of exotic ingredients available to them. So when you come across, as I did recently, a recipe for Irish Brack that included peaches, apricots, prunes and pumpkin pie spices, you can be sure that there is nothing Irish about it – the previous generation of cooks in Ireland would never have heard of some of those ingredients, much less been able to obtain them! There is a tendency to take any recipe at random, add a dollop of whiskey and then append the word Irish in front of its name! I have even seen it mentioned – horror! – in recipes for bread. Truth is that Whiskey is not much used in traditional Irish recipes – the Irish always preferred to drink it rather than cook with it! Guinness is a little different – for many years the Irish considered it to be not so much a drink or even a food but a whole food group all of its own! While it may not be traditional in cooking in the sense of going back centuries, it has been used for quite a long time in stews and as a marinade. But again, taking any old recipe and adding Guinness to the mix does not magically turn it into an Irish recipe. Irish tradional cuisine is a peasant cuisine and food in a poor household is never wasted. There is nothing that illustrates this so well as the pig. Few ordinary Irish households in the past would have eaten beef – this was a food for the rich – but many kept a pig and it is said that they ate every part of it except for the grunt. 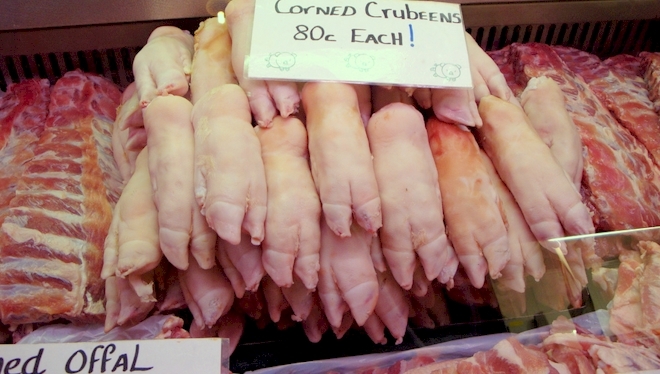 Crubeens (pictured top) or pigs trotters, tripe (pigs stomach) and drisheen (a blood sausage) were all popular dishes and are still eaten in parts of the country, notably Cork. Irish people are still extemely fond of their fried breakfast, which always includes pork sausages, bacon rashers and black pudding (another type of blood sausage). The killing of the pig was a ritual in which neighbours came together to complete the work, with everyone getting a parcel of meat to take home. In that way each time a pig was killed, several families had food. Since there was no refrigeration, what was not eaten fresh was cured or salted and hence bacon became a very important part of the Irish diet. When times are hard free food is a real bonus and there is and was (and is) plenty of it available in the woodlands and around the shores of Ireland. Summer is berry time and wild blackberries are abundant throughout Ireland as are rosehips and wild strawberries. The wet warm weather of late summer and early autumn brings mushroom season and wild mushroom can be found in large amounts in both woodland and on pasture, especially following a good rain shower on a warm day. A little later there are nuts aplenty, in particular hazel and beech nuts and crab apples ripen. All year round nettles, dandelions and thistles are readily available and very nutritious while elderflowers were (and are) used to make excellent wine or cordial. 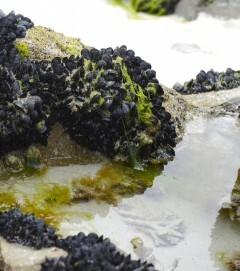 By the coast there is samphire and various types of edible seaweed. Not surprisingly all of these ingredients feature in traditional dishes. It’s impossible to talk about Irish food without mentioning the potato. They first saved us then almost destroyed us in history, but there are few households where the potato is not still a staple and anyone who makes even a basic stab at growing vegetables will plant a few spuds in their patch. They are eaten boiled, mashed, fried, chipped and baked, mixed with cabbage or scallions to make colcannon or champ, made into potato cakes and used to top pies and thicken soups or stews. It’s not uncommon to find potatoes cooked two ways on the same dinner plate. It’s not all about dinner either. The snack that Irish people miss most when they are overseas is Tayto, an Irish brand of potato crisps (or potato chips). There is even a Tayto theme park! And no night out on the town is complete without a feed of chips (or fries) liberally seasoned with salt and vinegar on the way home to soak up the alcohol! Irish people are fussy about their potatoes. Typically a supermarket will stock at least 5 or 6 different varieties, often more, with the varieties changing depending on the season and each suited to a particular method of cooking. Of all foods, the humble spud is certainly the most traditional. We may not be dependent on them in the way we were in the past but there are a lot of Irish people for whom a dinner without potatoes is not a dinner at all. 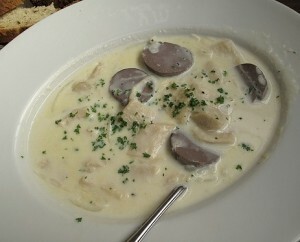 There are different types of the Irish Coddle, but my favorite is white Coddle. It is primarily a Dublin dish and in some parts, they make a brown coddle. The coddle is like a stew but it uses pork sausages and streaky rashers instead of beef or lamb. The white version is basically a cream sauce made with milk and thickened with either a butter and flour rue or just plain old cornflour. the brown as I said is like a stew. the whit is served over fluffy whole potatoes and then a big dollop of Irish butter on top. I believe you are somewhat wrong in saying that corned beef and cabbage is not Irish. The immigrants when they came over could not get the bacon so used the cheaper cut that is used for corned beef, therefore it was still a creation of the Irish just not while they lived in Ireland. I am going to make this stew. It looks really good,and I love cooking! I am happy to know they don’t really use whiskey in their food,because I was just on a website that had a recipe with whiskey. Now I know the real fact. My ancestors were Irish,so I still have a little blood from over there. I have Irish blood in me (much watered down), but Irish stew was made from mutton on mums side (her grandparents – poor – were from Co. Tipperary) but it was made from beef on dads side (wealthy linen merchants from Co Derry). On a personal basis I much rather it made with lamb – preferably mutton if I can get it. “El Yummo De Fox”. Love Colgannon too, would love to try other “traditional foods as well. I have always liked Irish style trifle. I also enjoy Irish style rice pudding served hot with jam. My wife and I will be visiting Ireland for the first time in May 2013. We have booked an eight day guided coach tour and I am eager to try as many of the traditional Irish foods as I can. I have read the recipes for various foods as well as the many comments by those who have already visited the country. My mouth is watering already. I want to go visit Ireleand so much! Any tips from anyone who’s been there on the best places to visit there? Since “The Potato” is not native to Ireland and was only introduced there in the 17th century, would you still consider it traditional Irish food? And if you do, you may reconsider peaches, apricots and pumpkin traditional Irish food as well. Just thinking. @potatohead Given the central place potatoes have in both our history and our diet, I think you can say that whatever its origin it is definitely an Irish food now. Great article and pretty much spot on as to Irish favorites and what is included. Gotta agree about the stew picture though…perhaps it was an attempt at starting a shepherds pie! I own an Irish Pub ( a NEWplace though..only from 1894) and all the recipes come from my Great Grandmother on down to my mom and Aunts. Delicious stuff! Take the time to do your research and you’ll be rewarded with the “true taste of Ireland”! True too that different parts of Ireland do things differently…my family wouldn’t put peas in anything!
. i really want som irish stew right now. what a great idea. not!!!!!! this artical was awful. hahaa. mkay. Mr. Makey. Mkay. i’d like some noodles per-say. count McBagel. time for some stew even though it looks awful still. er body dougy, er-er body dougy. Mkay…. I found this website by mistake while looking for Irish art on Ebay. I am from the Caribbean but I am part Irish. I love to cook and I regularly make Irish stew at home. What suprised me though was finding out that Black Pudding was made in Ireland! Over here in Trinidad it can be found all over the island being sold by various vendors. I am so happy to have found this site since my grandparents died when I was a baby and it was difficult for me to find out much about Irish cuisine. This site has opened a whole world of possibilities for me and I cant wait to try these new recipies!! While I agree the picture above may have been a poor choice, I strongly disagree with Joseph Tuite above. Where is he from? It IS tradition in many Irish families to prepare stew minus the potatoes, and serve it up with a nice mountain of CHAMP. I lived with my Dublin born gram & my pap from Kerry; when gram made beef stew she included potatoes. She made this when my dad’s family were over to supper (they were German, she thought they’d turn their nose up at lamb) But when she made lamb stew, she used lamb with turnip, parsnips, thyme & stout – no potato in it. 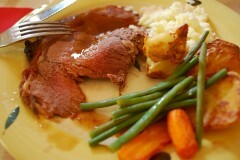 If she used mutton instead of lamb she added carrot and bay leaves. Then she made a HUGE pot of champ to go with. She learned to cook from her ma, but said she cooked mostly to please pap, so I don’t know where her stew recipes came from. And to the author, don’t apologize, there isn’t any one “real” version of “Irish” stew, every family makes it their own way to their own personal taste. The “real” version you mention above sounds like a good start. Nope sorry Arlene, thats totally in correct traditionally its not served with “champ” at all the potatoes are boiled in with the stew along with carrots onions beef and gravy soup/sauce and I’ve never heard of stew without potatoes EVER!. Thats pretty close to how “real Irish” people would have eaten and how we still eat it as yes it was and probably could still be considered peasant food. I’m Irish, from Dublin so have obviously eaten it all my life at home and in restaurants. Absolutely people vary it to their tastes thats the beauty of cooking but originally it was very simple no herbs or spices and made with the minimal of ingredients to feed as many people as possible. Also from the way Joseph Tuite speaks in his message I’d bet ya he’s probably a true blue dub or at least defo from Ireland. Glad to hear people are using a recipe that was once a very simple meal and fancyin it up! Stew without potatoes is SOUP!!!! Potatoes were unknown in Europe before the late 1,600s or so.. Traditional stew before that could not have contained them.. They were probably added to make the stew go farther, making a new tradition.. I have to say,taters are one of the best foods known to mankind.. Wonderful site. I am holding St Patrick’s Day dinner here in New Zealand for 12 folk. My husband’s family comes from County Kilkenny – Grevine and Gowran. I was delighted to find the Colcannon recipe which seems much more traditional than the others I have seen. Can you please tell me how many that will serve? I may have to double the recipe? I’ll off looking for other recipes on your site. Thank you so much. Best of wishes from Moira in New Zealand. Moira, I was reading through the comments from this site and yours really caught my eye. I saw that you mentioned that your husbands family were from the Kilkenny area, was he born there? I was born and raised in Gowran, Co. Kilkenny and moved to the States 23 years ago. nooo this is very nasty trust!!! I am a mixture of Scotch-Irish and German. I love Irish food and miss the Irish Pubs in Washington, DC. Sure wish we had one here in my area. It is generally Scots-Irish – but there is NO part of Scotland that used to be Ireland. Or vice versa. The term refers to people who came from Scotland and settled in Ireland, mostly in the North of the country in what is present day Northern Ireland. The Irish colonized the Scottish Highlands.. Some descendants were planted in Ulster.. Some just went back to Ireland, so they are more closely related to one another than to anyone else.. There is nothing traditional about that picture of stew on the web site, since when did a scoop of mashed potatoe enter the category of TRADITIONAL IRISH STEW..ehhhh yea just think about that. All the comments left are nothing but Shite Talk. You are absolutely right. I picked that picture in a hurry and should have given it more thought. The real version of Irish stew is here – and has NO mash! Image referred to has been changed. This is interesting, but a bit short! i live in Ireland and im doing a project on food in Ireland and France, for my French cultural studies project. Strangely enough its easier to write about French food! Cos i eat more Italian and Chinese food than “traditionally Irish food”, if there is such a thing anymore! this is awesome I’m doing this project for school on your heritage and i need food my boyfriends irish too how cool is that!!!!!!!!!! I love irish food it is so good i am mixed with irish and there is an irish pub around the corner from my house so i go there a lot to eat all the irish food possible!!!!!! Nice, i grew up on this same stuff, came over at 3, mum cooks but not often, so nice to have some old school food. your a third “clown” aswell! I love Irish foods,. I am 96% Irish and that makes it seem even tastier. I love Irish food. No food beats it. What the hell makes you ‘96%’ irish? I’m the Cheapest Dam drunk you’ve ever seen and I have the strangest desire for Matzo ball soup and a Cornbeef swandwich…….Go figure? Wow, this is great, I love my own home cooking, I love Irish stew! !